Cautioning against various threats facing the subcontinent, President Pranab Mukherjee on Friday said it was imperative for India to have an effective deterrence and strong defence to promote development and it must be prepared to use its "might" if the need arises. "Today, our nation is on the path of growth in all fields. While the nation grows and develops in all realms, the subcontinent also faces varied threats especially from non-state actors. 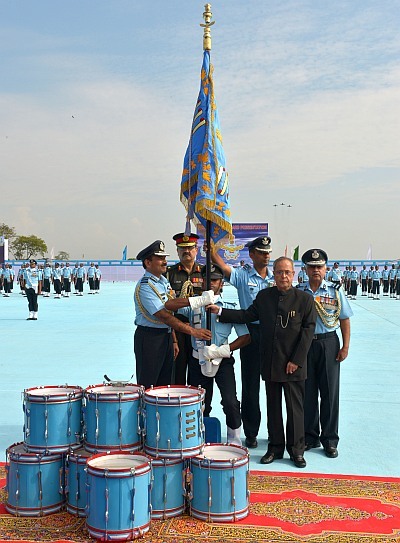 "To preserve peace and harmony and promote all round development, it is imperative for us to have an effective deterrence and a strong defence," Mukherjee said at the Tezpur Air Force base. The President, who is also the supreme commander of the armed forces, said though as a nation India was "firmly" committed to peace, "we must be prepared to use our might to safeguard the sovereignty of our nation, should the need ever arise." "We are a nation which believes in equality in all realms. The men and women who stand before us today epitomise our grit and determination towards this underlying cause. I am immensely proud of our armed forces for leading the path in this respect," he said. Earlier, the President presented the prestigious Presidential Standard to 115 Helicopter Unit and 26 Squadron of the Indian Air Force in Tezpur in "recognition of their selfless devotion and outstanding performance both during the time of war and in peace". The Presidential Standard, considered one of the greatest honours for an Air Force Unit, was presented at a grand ceremonial parade at the strategically located Tezpur Air Force Station, one of the premier air bases of the Indian Air Force in the eastern sector. Saarang helicopters and Sukhoi fleet performed manoeuvres at the function where Air Chief Arup Raha was also present. "These distinguished flying units have a glorious past and a rich tradition of professional excellence. Since their inception, they have rendered illustrious service to the nation and done us proud," the President said. "Their rich heritage and stellar efforts in the pursuit of excellence have set a benchmark for others to emulate. For their selfless devotion, professionalism and courage in the face of adversity, the nation honours them today with a deep sense of gratitude and appreciation," he said. Lauding the IAF, he said from Kanyakumari to the mighty Himalayas, the resilience and tenacity of the Air Warriors has been a source of tremendous pride for the whole nation. "The professional excellence, grit and determination exhibited by them over the past few decades is highly laudable. Their excellent performance has been acknowledged both in India and abroad, during their participation in various international exercises," Mukherjee said. The 115 Helicopter Unit has had a glorious operational record. It was formed in Chandigarh in April 1967 with Mi-4 Helicopters. During the 1971 Indo-Pak War, the Unit undertook various operations in support of the Army offensive, casualty evacuation and search and rescue operations. Raised on April 1, 1967 in Guwahati, the Helicopter Unit earned its sobriquet 'The Hovering Angels', while incessantly working to provide relief and succor to flood-ravaged Bihar in 1975. The 26 squadron was formed in Adampur in January 1968 and was the first squadron to be equipped with the indomitable Sukhoi-7 aircraft. The squadron actively participated in the 1971 Indo-Pak War where it acted as a force multiplier in support of the army offensive. In 1977, the squadron was re-equipped with MIG 21 BIS aircraft and moved to Pathankot. Since its inception, the squadron has undertaken significant operational missions, including several missions during the Kargil conflict of 1999 and towards guarding the northern skies during the long period of activation as a part of Op Parakram. "In acknowledgement and recognition of their outstanding performances, I award Standards to 115 Helicopter Unit and 26 Squadron. On this occasion, I take the opportunity to compliment the personnel and families of 115 Helicopter Unit and 26 Squadron, both past and present, for their selfless service and dedication towards the Nation," he said. Can NaMo do a NaRa?